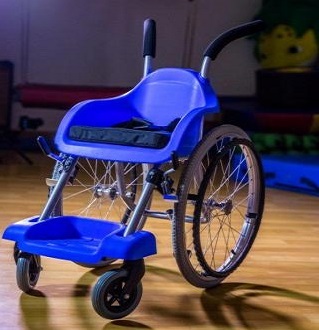 An innovative, children designed wheelchair, to fit semi active children with less postural needs, estimated for ages 5 to 9, in urban and semi-urban areas. It was developed under the directions of the professional team of the ALYN Pediatrics Rehabilitation Hospital,and complies with ISO 7176 and EN 12183 International Standards The chair features a compelling design, light weight, very low maintenance, high durability, and the affordable tag price of $100 at less developed environments. Delivered with cushion, safety belt and anti tilt device. the wheelchair is delivered to distribution centers not-assembled, with easy assembly booklet and tools included. Requires max 20 minutes to assemble the chair. easy to clean -Assembly required- supplied with easy instructions and tools.